eBay File Exchange is a new selling tool that enables medium to high-volume sellers to list on eBay by submitting a single file and to receive sales status information in a standard flat file format. eBay File Exchange allows sellers to interact directly with eBay through a comma-separated, semicolon-delimited, or tab-delimited flat file that can be created from an MS Excel spreadsheet, MS Access, or other inventory software. Who Can Use File Exchange? 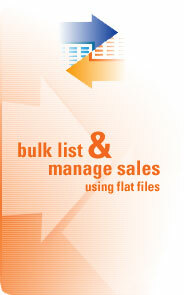 File Exchange is a free product. Platform independent: Create a listing file from almost any application on any operating system. Categories and formats supported: File Exchange supports all eBay listing formats including Auctions, Fixed Price, and Store Inventory across all categories. Automated file template generator: Tell us what category you want to list in and File Exchange will create the file template you need, which include the columns for any item-specifics. Support for HTTP Post: Automate your listing through scripting and posting via HTTPS. Volume limits: 1,000 actions per day where an action may be listing a new item, revising an active listing, relist a completed listing, etc.